Shouldn’t sane folks like us do everything we can to expose Mitt Romney for the spineless, unprincipled Conservative sellout he is? Yes, of course we should. 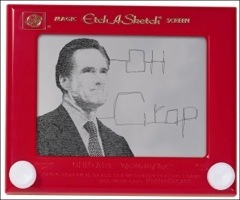 The best way, in my humble opinion, is to continue to expose all his most egregious Etch a Sketch Moments. Even more surprising is how the GOP has had to swallow their castor oil and accept this liberal/moderate/conservative guy as their nominee. I found this impressive list compiled by a group whose mantra is “Serious Political Commentary for Serious Conservatives” Less Government is the Best Government, a Republican website. 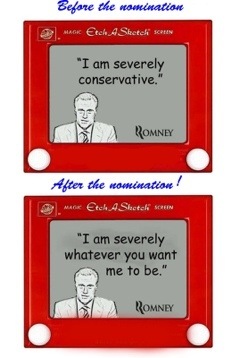 The list has 28 of Romney’s biggest flip flops, all referenced and documented. Feel free to use these points when you’re arguing with a Republican who most likely votes against his/her own best interests. On a side note, the thought of Romney hosting a White House Correspondents Dinner makes him absolutely unelectable! !